Turn your Porsche 996 into a classical 911 model! Our Porsche foryourlightsonly ® Sequipment box sets new design standards to the 996 model. By means of our product you will be able to change the appearance of your Porsche and go back to the classical look of the 911 model. Additional safety is guaranteed by the included daytime running lights. The fog lights and the direction indicators are completely covered so that only the dipped headlights are visible. Just like in previous models, and their predecessors. The understated revival of the Classical 911 look will inspire you! The headlight eyebrow is characterized by an extremely high degree of accuracy. Our product was designed and developed in Germany by means of the latest 3D laser procedures. It is made of high quality ABS plastic and can be painted conventionally. The strength of the material was selected in such a way that it remains exactly uniformly, i.e. there is no need for reworking. 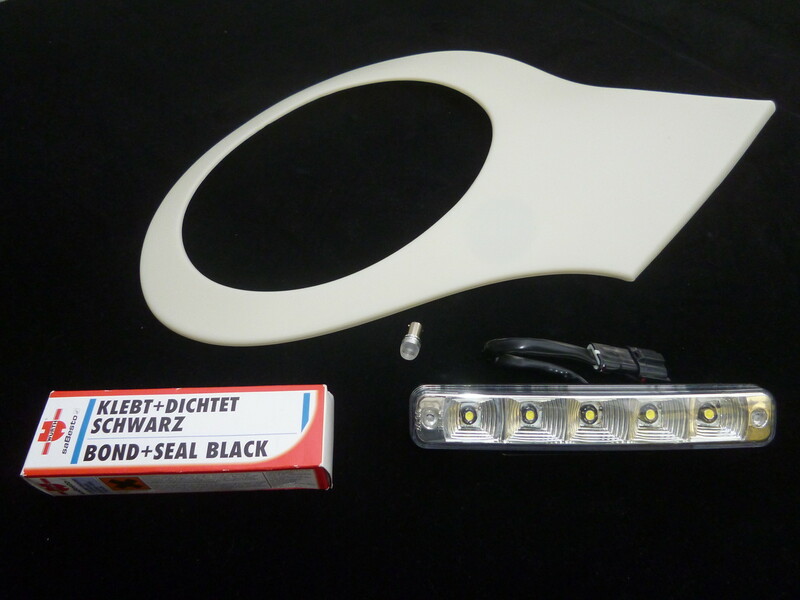 On vehicles with Xenon lights the function of the headlamp wipe system remains unaltered. LED direction indicators are available on request. Daytime running lights, headlight eyebrows and direction indicators are in compliance with road traffic regulations. Also an expert opinion is included. A registration is not required. The self-assembly takes about 2-3 hours. But of course, any garage will be able to carry out the installation. A comprehensive, coherent and illustrated instruction booklet will be supplied with your foryourlightsonly®Sequipment box. Please contact us if you require assistance or advice. The set is suited for 996 Carrera 3.6 facelift models (from MY 2002) with Xenon lights. Upon request, we will deliver the headlight eyebrows already painted in your desired colour. Just indicate the colour number or name of your vehicle. Please note that painted headlight eyebrows cannot be returned. Delivery period is about one week after receipt of payment. The set is suited for 996 Carrera 3.6 facelift models (from MY 2002) without Xenon lights.